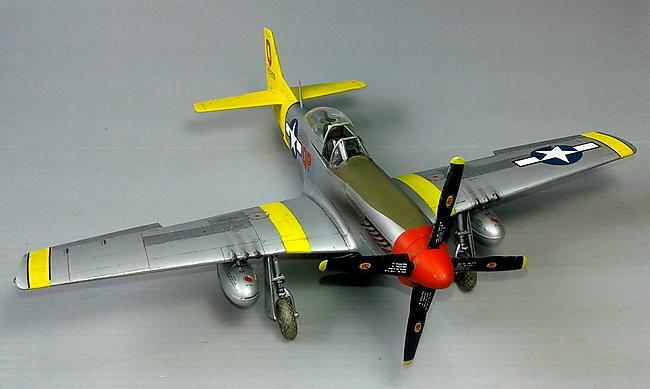 Hey folks… so this is a Tamiya 1:48 Mustang and as such requires very little in the way of explanation or comment from me. However I would crave your collective indulgence for just a moment or two… Over the years I believe I’ve built about a half-dozen of these gems and they never, never disappoint. Engineering is perfect, detail is good and easily improved upon with a touch of Eduard Etch (this has the Zoom set & placards) and for the price of the base kit, I would be hard pressed to think of a better quality project for relatively little outlay. OK, advert over, and no I’m not on commission ! – Built in a little over a week for a Group Build on another forum, not quite straight from the box, there’s an Ultracast seat in the pit, and the pit has been ‘dressed-up’ with the aforementioned Eduard Zoom set and placards. The much talked-about ‘fiddly fit’ of the canopy to the frame simply didn’t occur, patience & careful cutting from the sprue negated any ‘issues’. Paint is my new ‘go-to’ NMF – AK Xtreme Metal enamel lacquers, the rest is all Tamiya acrylics. Special mention for the decals – Quality control at SuperScale really knew what they were doing all those years ago – this sheet 48-1176 – is twenty-odd years old and behaved impeccably. So as ever, thanks for taking the time to look and / or comment. Until the next one. I like it !!!! Well done Ian……………. Very nice!! and very colorful. Agree wholeheartedly with AK metals verdict. I’ve been using them now for about three years in a variety of projects, both on their own and in combination (Steel and Bronze in a 70-30 mix gives a warm, smokey finish, for example.). Sparkling build, by the way. Ian, You’ve only built 6 ?, that’s a nice start. I’ve got 8 on the shelve ! This looks very nice, I really like the scheme and your NMF looks excellent. I have not tried AK lacquer, however from the results you got, I may have to give that a try. Thanks for sharing. Now that’s a pretty pony Ian. I’ve build two, Passion Wagon and Duchess Arlene and they are posted here. 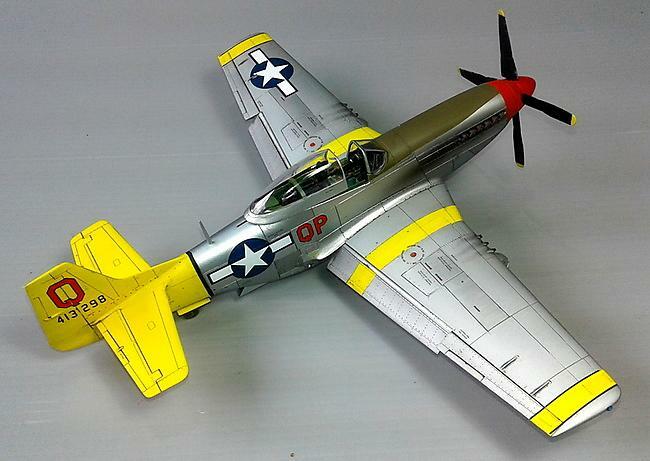 And like you found the kit to be excellent and can be found at very reasonable prices, especially at model shows. Nicely done sir. An excellent build, Ian. Very precise with a lovely paint job. A thoroughbred Pony. Nice work, Ian! Did you use any clear coats over the AK metallics? Yep, Johnsons Klear / Future or whatever it’s calling itself this week. Then Flory Wash, next decals, then Humbrol Satin Cote (sic) to finish. Beautiful work, Ian. 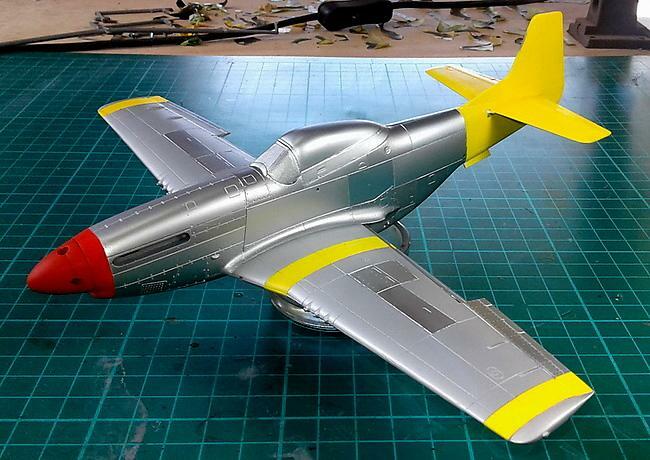 I have some of the AK metallics and plan on using them on a P-51 or MiG-21 soon. Thanks for the insight. Ian @ij001, Awesome is the word that comes to mind. Really nicely finished. Well done! 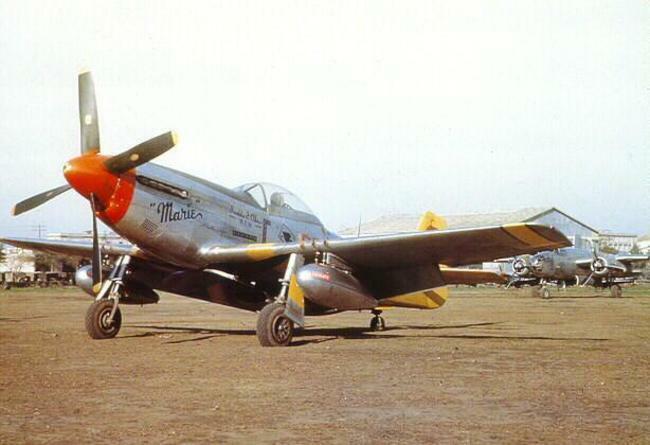 Ian, @ij001 that’s a beautiful Mustang! “Marie” has quite a lovely scheme. 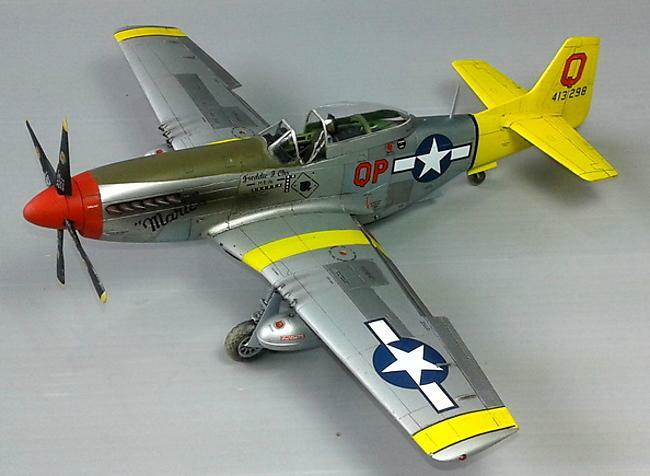 LOVE those yellow-tails! 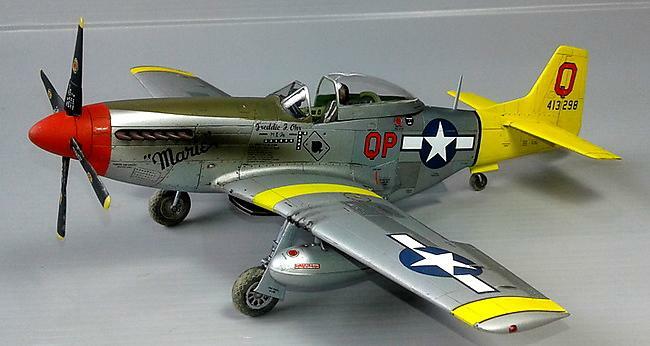 Have you done one of the new Airfix P-51s, and if so, how does it compare. 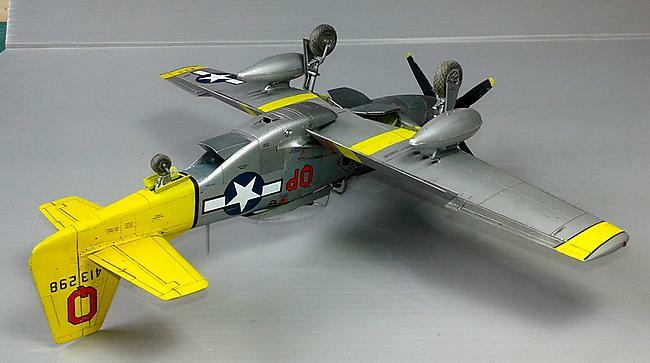 I have one of the new AFX kits, but not the TAM, nor have I built mine yet, but it sure looks excellent. I can’t compare them, however. 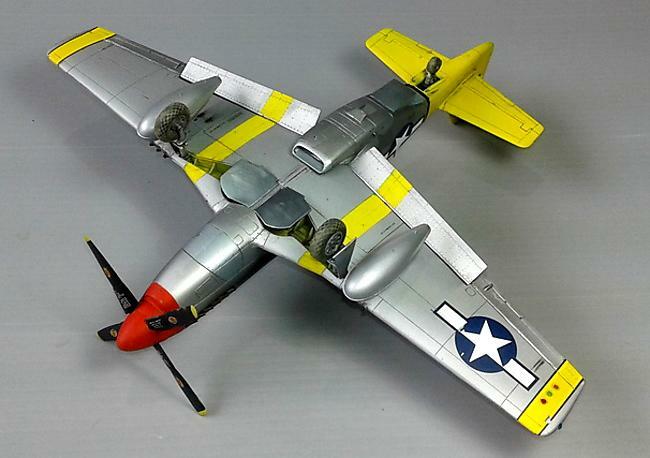 Tamiya pretty well has got their act together when it comes to fine kits at value prices. I’ll be looking to try an NMF finish and I’ll definitely try the AK line. I have some Bare Metal foil to try, but haven’t used it yet, either. 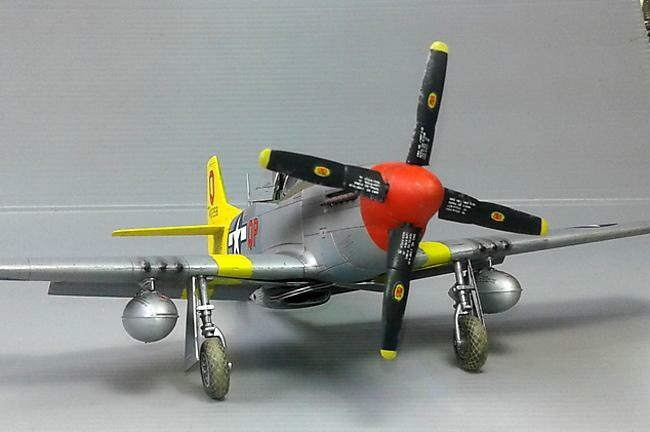 Great P-51, Ian – thanks for sharing!!! Not yet, Jeff… no need as I have at least one H’gawa and three other Tamiya kits on the shelf, and I ain’t going to live forever ! Amazing Stang! I can trully appreciate your comments about this kit and your build experience with it. I often find myself taking on more complex and challenging builds with kits that can be frustrating when it comes to engineering/design. But these simple Tamiya’s never disappoint ever! Between every few complex builds I find myself searching these kits out. I just built their very old BF-109 kit and like you spent about a week or less, built mostly OOB. What a joy and outcomes still compete with the more complex, modern stuff. Great Build! 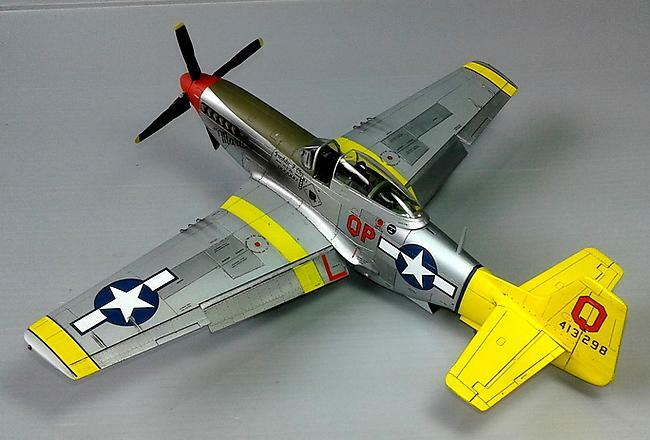 A great looking Mustang – really like the yellow-tail scheme – makes it stand out nicely. The NMF work is excellent, and overall the model just well done down to the teeth! Thank you folks for the comments, as ever I never take it for granted and really do appreciate it. So this weekend, not only is it the UK IPMS Nationals @ sunny Telford but it’s also the IPMS NZ Nationals at very sunny Karapiro Domain outside Cambridge. I’m entering a couple of builds, and for my sins will be judging in the AFV classes (possibly Sci Fi too). I’ll post some pics next week. Good luck with your entries, Ian! Spectacular build. I really like the contrast between bright colours and the more military OD and no-nonsense NMF. By the way; when & where were the 2 photos of the REAL Marie taken? Amazing work, brother. Masterpiece! I like how you made the wings, showing how they used to be painted.